Where the land meets the sea at the southern tip of West Bengal lies the Indian Sunderbans, a stretch of impenetrable mangrove forest of great size and bio-diversity. A UNESCO World Heritage Site, the Sunderbans is a vast area covering 4264 square km in India alone. The Indian Sunderbansforms the largest Tiger Reserve and National Park in India. A paradise for birdwatchers, the list includes such rarities as the Masked Finfoot, Mangrove Pitta and the Mangrove Whistler. The Sunderbans are a part of the world's largest delta formed by the mighty rivers Ganges, Brahmaputra and Meghna. Situated on the lower end of the Gangetic West Bengal, it is also the world’s largest estuarine forest. The Sunderbans is criss-crossed by hundreds of creeks and tributaries. It is one of the most attractive and alluring places remaining on earth, a truly undiscovered paradise. The Sunderbans forest is home to more than 250 tigers. 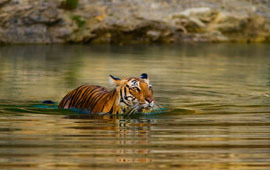 The Bengal Tigers have adapted themselves very well to the saline and aqua environs and are extremely good swimmers. As you enter the adventurous wild land of the Sunderbans you'll be thrilled to see the chital deer and rhesus monkey. The aqua fauna of Sunderbans include a variety of fishes, red fiddler crabs and hermit crabs.There are crocodiles, which can be often seen along the mud banks. Sunderbans National Park is also noted for its conservation of the Ridley Sea Turtle. There is an incredible variety of reptiles also found in Sundarbans, which includes king cobra, rock python and water monitor. The endangered river Terrapin, Batagur baska is found on the Mechua Beach, while the Barking Deer is found only in Holiday Island in Sunderbans. This meticulously maintained and charming river launch is an experience in itself. This self-contained floating abode can sleep eight in comfort. The bathrooms are fully equipped with running water and showers. Complete electricity back-up is provided. The kitchen serves delicious Indian and western meals. You sit in the canopied upper-deck on comfortable chairs and watch the wonders of the Sunderbans go by.